It is easy to understand why Impressionist painters and English aristocrats were drawn to Nice. With its sunny weather and stunning seaside scenery, this picturesque city seems to mesmerize its visitors. Surrounded by the serene blue waters of the Baie des Anges and sheltered by the foothills of the Maritime Alps, Nice has a mild climate year-round. The city was originally discovered in the 1820s by the British as a winter resort. Today, it is still a popular vacation destination. Considered the center of the French Riviera, Nice is the perfect starting point to explore the dazzling Côte d'Azur coastline. Nice is a place to enjoy life, to take in the beauty of the gardens and the sea, and to soak up the vibrant Mediterranean energy. The city has a distinctive Italian character that's especially visible in the Old Town. Whether wandering the quaint cobblestone streets or strolling the famous Promenade des Anglais, visitors will be delighted by the beauty, culture, and ambience of Nice. The picturesque Old Town of Nice, with its maze of narrow alleyways and cobblestone streets, has a lively ambience reminiscent of Italy. 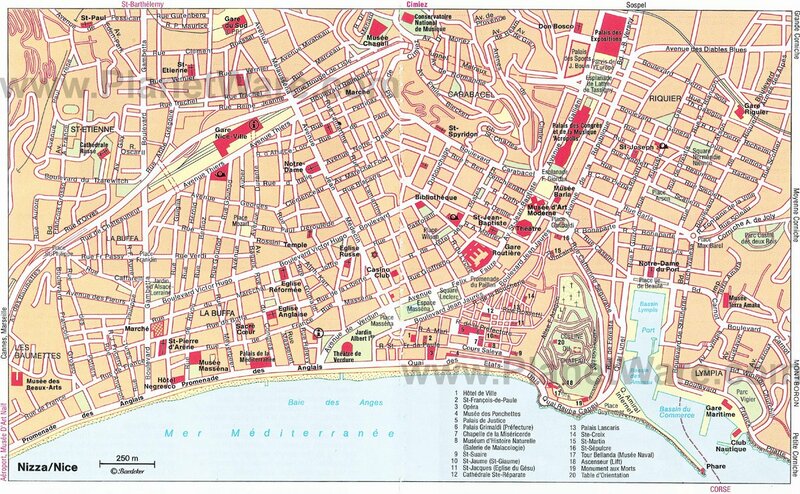 Popularly known as "Babazouk," the Vieille Ville begins at the western end of the Colline du Château (Castle Hill) and is bounded by spacious boulevards, including the Jardin Albert I, Place Masséna, and Promenade du Paillon. The southern end of the Old Town borders the Ponchettes market stalls at the Cours Saleya, where fishmongers and grocers sell fresh products. The famous Marché aux Fleurs (Flower Market) is a traditional Provençal event that beautifies the street every morning (except Mondays) with colorful blossoms. Besides the gastronomic appeal, the area around the Cours Saleya has many cultural attractions. On the Quai des Etats-Unis is the Galerie des Ponchettes (Musée Dufy), a museum dedicated to the artwork of Raoul Dufy. This museum displays an outstanding collection of Dufy's charming, vibrant paintings. Nearby (less than a five-minute walk away) on the Quai des Etats-Unis is the Musée Alexis et Gustav-Adolf Mossa. The 19th-century artist, Alexis Mossa, was renowned for his landscape watercolor paintings, which feature scenes of Nice, the Côte d'Azur, and the Provençal countryside. His son, Gustav-Adolf Mossa, also painted landscapes and later developed his own unique surrealistic style. Exploring the Old Town further, north of the Cours Saleya, tourists will come across the Palais de la Préfecture, the Nice Cathedral, and another noteworthy 17th-century Baroque church. The Palais de la Préfecture on Rue Alexandre Mari is a splendid Neoclassical building, also known as Le Palais des Rois Sardes because it was the former palace of the Kings of Sardinia. Exemplifying 17th-century Provençal Baroque style, the Cathédrale Sainte-Reparate has an exquisitely decorative interior, featuring Corinthian columns with gilded detailing and many little cherub figurines in friezes surrounding grand pieces of artwork. Just a few steps away is the Eglise Saint-Jacques, prized for its delicate frescoes and impressive sculpture collection. Continuing farther north is the Palais Lascaris (Rue Droite), a sumptuous Baroque palace from the 17th century that was originally the home of the Lascaris-Vintimille family, the Counts of Castellar. On the ground floor, the fine entrance hall is fitting of a grand palace. The rooms on view feature furnishings from the 17th and 18th centuries, Flemish tapestries, rich stucco work, and ceiling paintings of the Italian school. Regular exhibitions held here showcase the artistic heritage of the region. The most emblematic street in Nice, the Promenade des Anglais is a gorgeous pedestrian area that follows the curve of the Baie des Anges beaches. This legendary seaside road is lined with planted palm trees and filled with elegant gardens. Originally just a small footpath, the Promenade des Anglais was developed by Englishman, Reverend Lewis Way in 1820 at his own expense. It was then called the "Chemin des Anglais." The road was further enhanced in 1931 when it was given two separate roadways. At the time, Queen Victoria's son, the Duke of Connaught, inaugurated the promenade in royal style. Today, the road traffic has been diverted with underground tunnels, making the promenade ideal for people to stroll. The Promenade des Anglais is also popular with cyclists and skaters. Since the Belle Epoque, it has been graced by opulent buildings such as the Palais de la Méditerranée theater and the exquisite Villa Masséna (65 Rue de France) palace, once the home of a Princess. Now a historic landmark open to visitors, the Villa Masséna houses a museum of art and history and is surrounded by a gorgeous park with formal French gardens. Another exceptional building on the promenade is the Le Negresco (37 promenade des Anglais), which is listed as a National Historical Monument. Le Negresco is a lavish five-star luxury hotel with a world-class art collection. On a hill overlooking the Nice coastline, the site of Castle Hill was the first area of Nice to be inhabited by the Greeks two millennia ago. Once considered impregnable, the citadel was destroyed by soldiers of the French King Louis XIV in 1706. Now the property is set aside entirely as a park. This idyllic place is a pleasant oasis of greenery, shady trees, and rushing waterfalls. The park inspires visitors to enjoy a leisurely stroll and take in the spectacular views. From this point, the panorama includes the Baie des Anges, the Vieille Ville, and the Nice harbor. Inside the park, boutiques and restaurants as well as the ruins of two old churches are worth seeing. At night, the Colline du Château is illuminated with special lighting effects. Visitors can arrive at the Colline du Château by foot from the OId Town of Nice or take an Art-Deco lift or escalator from Place Garibaldi. Another option is to take the Little Tourist Train that departs at the end of Quai des États-Unis. After visiting the park, tourists may take the steps that lead from the Colline du Château down to the Promenade des Anglais, along the way passing the Tour Bellanda. This massive 16th-century tower was built on the site of the Bastion Saint-Lambert, where Hector Berlioz composed his opera "King Lear." The tower houses the Musée Naval (maritime museum). Sitting on the hill of Cimiez, the Musée Matisse is must-see attraction for art lovers. This delightful museum lies in a historic Genoese villa surrounded by splendid Italianate gardens. The permanent collection represents an extensive and diverse ensemble of Matisse's works. There are 68 paintings, 236 designs, 218 drawings, and 56 sculptures (almost all the sculptures Matisse ever created), along with interesting sketches for the decorations of the Chapel in Vence. The entire ensemble of works provides an overview of the artist's creative method and genius. It was given by Matisse's family to the city of Nice, where the artist lived from 1918 until 1954. The museum also hosts temporary exhibits every year as well as screenings of art films and conferences. This museum of modern and contemporary art was opened in 1990. Housed in a sleek building created by architects Yves Bayard and Henri Vidal, the building has four towers faced in Carrara marble from quarries in Carrara, a town north of Lucca in Italy. A whimsical modern art installation adorns the courtyard. The museum's collection represents a cross section of fine arts from the 1960s and 1970s, including New Realism and Pop Art, American Abstracts, and Minimalists. Particularly noteworthy are works on display by Yves Klein, of the Nouveaux Réalistes movement, who was born in Nice in 1928. The museum showcases his work in one room and on the roof terrace, which also offers breathtaking views of Nice. This verdant park-like area is located between the Avenue des Phocéens and the Avenue de Verdun. The expansive gardens extend north as far as the busy Place Masséna, which boasts the Fontaine du Soleil, a splendid fountain featuring a statue of Apollo, the Greek Sun God. The Jardin Albert I has a pleasant open-air theater, the Théâtre de Verdure surrounded by pine and palm trees. In the spring and summer, this outdoor venue offers music concerts, including rock festivals and performances by popular rock bands. A short walk away from the garden is the busy Avenue Jean Médecin, one of the principal shopping streets in Nice. The neo-Gothic Church of Notre-Dame is worth a look while visiting the neighborhood. Admirers of Marc Chagall will be delighted by this museum. The Musée Chagall houses the most important exhibition of Chagall's works in the world. The collection includes Chagall's paintings, etchings, lithographs, sculptures, stained glass, and mosaics. There are also wall tapestries on Biblical themes. The museum's concert auditorium features a stained glass wall that is a magnificent example of Chagall's artistry. The museum also displays temporary exhibits of works by other artists. Built in 1912 by Tsar Nicholas, the Cathédrale Orthodoxe Russe Saint-Nicolas is considered one of the most beautiful Orthodox churches outside of Russia. Inspired by the Muscovite style, the cathedral has a richly decorated interior with many ornamental icons, murals, and carved woodwork, as well as an iconostasis of embossed metal. A virtual jewel box, the interior contains historical and religious objects that were brought here from Russia during its time of turmoil. The cathedral is still used as place of worship. Visitors are admitted but must respect certain rules: Men will not be admitted bare-chested or in shorts. For women, mini skirts and shorts are not allowed, shoulders should be covered, and a head covering is preferred. Guided tours of the cathedral are available (in English, French, or Japanese) daily. In the university district of Les Baumettes, the Musée des Beaux Arts offers an extensive collection of works spanning the 15th to 20th centuries. The collection represents French paintings, including French Impressionist, Italian, and Flemish works. Highlights are the 17th and 18th-century French paintings, and 19th-century paintings and sculptures. Artists represented include Chéret, Fragonard, Braque, Carrière, Chagall, Degas, Monet, Sisley, sculptures by Carpeaux and Rodin as well as pottery by Picasso. The museum also houses the Dufy painting collection and the Alexis and Gustav Adolf Mossa art collections. A short walk away from the Musée d'Art Moderne et d'Art Contemporain, the Place Garibaldi is one of the largest squares in Nice. Designed in the late 18th century and bordered by stately Baroque buildings, the square now has a modern urban feel as it is at the junction of four high-traffic thoroughfares and is crossed by a tramline. Gracing the square is a statue of famous Nice resident, the Italian freedom fighter Garibaldi. Set in a grove of hundred-year-old olive trees, this lovely garden across from the Cimiez monastery is a wonderful place of relaxation. On a sunny day, one of the most enjoyable things to do is to meditate on a park bench or take a scenic walk along the garden paths. Not just for nature lovers, the Arenes de Cimiez Park will also appeal to history buffs. Amid the trees and lawns of the park are archaeological remains from the ancient Roman city of Cemenelum. The park is open to the public free of charge and has restroom facilities. Luxury Hotels: Right on the Promenade des Anglais and in the center of all the action, is the 5-star Hyatt Regency Nice Palais de la Mediterranee. This hotel features a spectacular pool area overlooking the sea and a gourmet restaurant. Clinging to the cliffs below Colline du Chateau, and steps to Vieille Ville, is the Hotel la Perouse. The view of the city and ocean from the rooftop hot tub is spectacular. A smaller boutique hotel, set in a 19th-century mansion, the 25-room Hotel du Petit Palais is conveniently located near the Matisse and Chagall museums. Mid-Range Hotels: Set back a block from the beach, a five-minute walk to the train station, is the new La Villa Nice Victor Hugo. This hotel offers modern rooms in a beautiful Belle Epoch building. Also recently opened in the same area, with quirky and fun décor and a children's play area in the lobby, is the Ibis Styles Nice Centre Gare. Cozy, clean, and comfortable describes the Grand Hotel Le Florence, on a pleasant pedestrian-only street, close to the Vieille Ville. Budget Hotels: High on a hillside, about a 15-minute walk to Vieille Ville, the Logis Le Panoramic offers low-cost rooms with tremendous views, and some rooms have terraces. Steps from a tram stop and less than two kilometers from the beach, the Star Hotel has basic but comfortable rooms. Around the Colline du Chateau headland, in a quiet location close to Port Lympia, where some of Europe's most spectacular yachts are moored, the Clair Hotel is a good family option. See the Top Sights: An excellent way to see the highlights of Nice is by taking a Half-Day City Sightseeing Tour. This guided tour stops at top cultural attractions, including the Promenade des Anglais, the Musée d'Art Moderne et d'Art Contemporain, the Russian Orthodox Church, and the Place Garibaldi. The tour also allows you to experience areas of the city that are more difficult for most tourists to fit into a visit, such as a jaunt up to the lovely park on Castle Hill and a drive along the Middle Corniche road that affords sensational coastal views. Bike around the City: Tree-lined city squares, sun-soaked beaches, Nice Old Town and Market, and Promenade des Anglais are some of the highlights on the Nice City Bike Tour. This fun three-hour excursion includes your bike; helmet; an English-speaking guide; and raincoats, if needed. This is a small-group tour with a maximum of 14 people. Take a Day Trip: Medieval hilltop towns and glitzy Monaco and Cannes are only a short hop from Nice, and a day trip tour is a convenient way to see them. Relax and forget about driving or finding your way around on the Monaco and Eze Small Group Day Trip from Nice. In the hilltop town of Eze, you can visit a traditional perfumery and admire breathtaking views over the French Riviera. 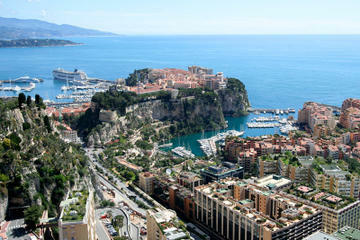 In glamorous Monte Carlo, you can explore the old town and live it up at the palace and other sites. Another fun day trip that includes Monaco and Eze is the French Riviera Small Group Day Trip from Nice, which also visits Cannes and the beautiful seaside town of Juan-les-Pins. Both these full-day tours include professional guides, transport in an air-conditioned minivan, and convenient hotel pickup and drop-off in select areas. Overlooking the serene, azure waters of the Baie des Anges, Nice is located near other gorgeous and glamorous French Riviera resorts like Monaco (20 kilometers away) and Cannes (33 kilometers away). Many smaller seaside towns and charming villages are also within easy reach, ideal for taking a day trip or for including on a tour of the Côte d'Azur coastline. For those who want to explore the pastoral region of Provence, it's worth driving outside Nice to the picturesque countryside, where the hilltops are dotted with enchanting medieval perched villages. 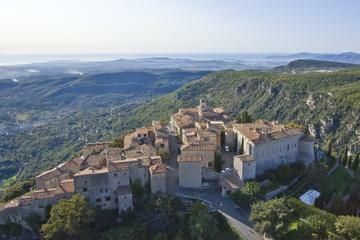 Noteworthy Provençal towns close to Nice include Saint-Paul de Vence and Grasse.